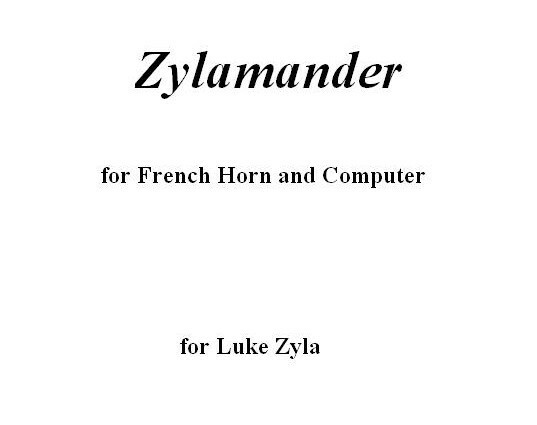 Zylamander was commissioned by Luke Zyla, with support from the Meir Rimon Commissioning Assistance Program of the International Horn Society. It is one of a series of works I have written for solo instruments and computer, the first of which was called Gerrymander, written for the clarinetist, F. Gerard Errante. The focus of these works is on exploring various kinds of interaction between a live performer and a computer “accompanist.” The computer captures material played by the solo instrument during the performance and uses that material (as well as some pre-recorded sounds) to build a musical accompaniment that is always similar, but never exactly the same, from performance to performance. Zylamander relies heavily on pitch tracking throughout the piece, not only to follow the score and keep pace with the performer, but also for sample triggering, contrapuntal harmonization, and other “intelligent” effects. In all of these pieces, I have tried to take advantage of the full range of sounds that these wonderful acoustic instruments can make in the hands of great performer. Like a good accompanist, the computer supports and enhances the performance of the soloist, but hopefully, never obscures or overshadows it.